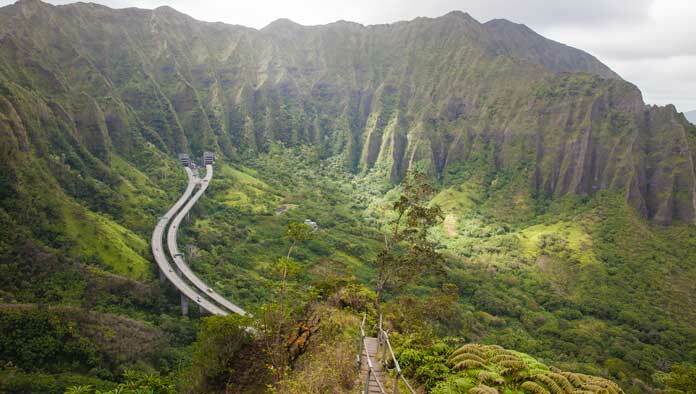 Oahu is one of the Hawaiian Islands that has the most breathtaking hike in the country. 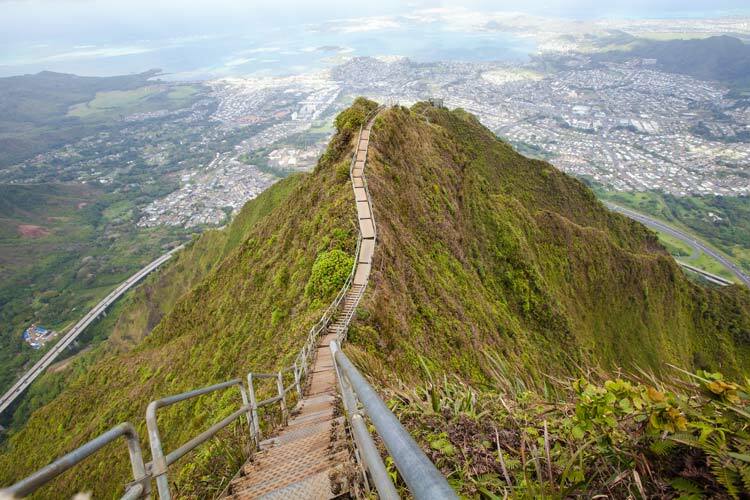 This walk is called the stairway to heaven Oahu, also known as the Haʻikū Stairs. In the 1940s the US Navy began construction on the Haiku Radio Station and deemed the Haiku Valley with its massive and swooping peaks, the perfect location for all their antennae. 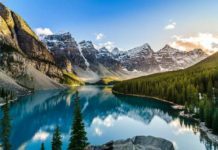 At first, a wooden ladder was used to access the mountains, followed by wooden stairs. They decommissioned the Navy base in the 1950s, and the US Coast Guard took control of the site for its navigation system. Local authorities installed steel stairs for better and safer access. You can still see parts of the wooden stair remnants near the metal stairs. The stairs number to almost 4,000, and it takes hours and lots of water and strong legs to witness the gorgeous scenery in Hawaii. The stairway to heaven Oahu is technically not open to the public. But that doesn’t stop people from taking the most beautiful and treacherous hike ever created. A guard stands at the bottom, as a scare tactic to keep people away. Some people report that if you’re nice, he will allow you through. The guards also work specific hours, so if you arrive during their off hours, you can ascend the stairs. To access the stairs, you must go through a residential area. Many of the residents are not too happy about it and will call the police on you. If you decide to see how brave you are and attempt the stairs and reaching them, it is wiser to take a taxi and not park your car outside someone’s house. There is another way to access the stairs through the Middle Ridge Trail. This stair access is unfortunately closed to the public from that way as well if you decide to listen. Whatever way you choose; it is best not to get caught. Local authorities threaten with fines and other punishments, and you want to avoid attention from the guards and police. These stairs stand on and cross mountains, and at the tops of the hills. The stairs are small, narrow, and old. There are many rescue missions executed, and people have been hurt, gone missing or even killed. The rumor is being that the guards may start cracking down and turn people away. It’s deemed too dangerous for public use, and they closed the stairs. Dozens of people a day tackle the mountain stairs for the breathtaking views. 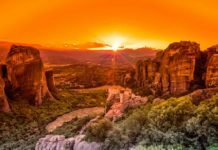 Some hikers sneak up through the stairs in the darkness, to watch either the Hawaiian sunrise or sunset by mountaintop, and are less likely to get caught. 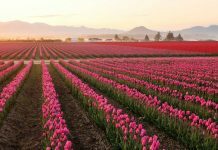 If you decide that this trail is worth the rave reviews that people that have given it, there are some things you should know. Storms earlier in 2015 have damaged sections of the stairs. People can still get through but use caution. If you have a fear of heights, this trail should not be an option. Some parts are extremely steep. They’re in fact so steep that you have to turn around and go down backward, as if on a ladder. There are handrails on the stairs because the drop off the sides is literally down a mountain. And you are so high up at some points, that hikers have reported that the clouds were actually below them. Take water and snacks, and a waterproof jacket or covering. If you pass other people on the trail, it is a very tight zone to move. Typically, one person has to step over the rail so the other can move, making this very dangerous. So please use caution as the Haiku Stairs do not care if they lose a traveler. Having the proper gear is important. The stairway to heaven Oahu is strenuous and tiring. 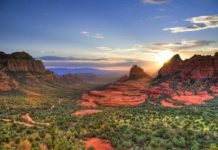 This hike is not for children, only adults, and adults that have hiking experience and are in good shape because this hike will wear you out. Just remember that getting to the top is only half way, you must return down as well. If you’re attempting to be sneaky and climb or descend the stairs in the dark to avoid detection, a headlamp or flashlight is of utmost importance. Also, tell someone where you are going, and an estimated time you should be back as an extra precaution. Another important note is to wear shoes and gloves with a good grip. The mist and clouds can cause moisture, not to mention when it rains, making the metal handrails and stairs damp and slippery. The last thing you want is a slip and fall off the Stairway to Heaven or injure yourself on an illegal trail. The Stairway to Heaven Oahu, is it worth it? If you can sneak past the guard, find where the trail begins, ascend to dizzying heights on tiny little stairs. And descend when you think your legs are about to give it out, was it all worth it? YouTube videos and photographs displayed online by those that braved the Haʻikū Stairs and succeeded, show that yes, it was all worth it. The views of the island and surroundings are unparalleled. And seeing the history of the old steel stairs and communication base on the mountain makes you wonder how and who was ever brave enough to hang from the mountaintops while installing a staircase. When you climb the stairs, you’ll see from the peaks the array of blues that layer the ocean and, the green mountains of lush tropical landscape. 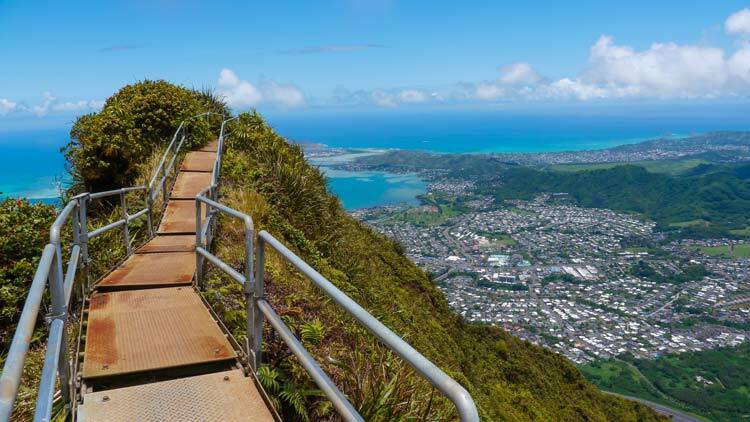 Besides that you’ll see far off surrounding isles and mountains, as the stairway to heaven Oahu is appropriately named, for the view from the top truly is heaven.